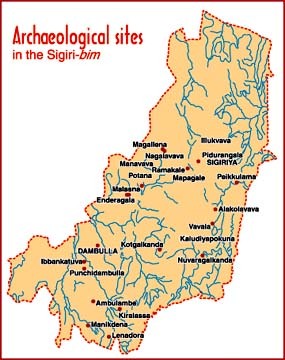 There are several old monasteries at Pidurangala, Enderagala, Ramkele, Manikdena, and Kaludiyapokuna, which were not only important as religious foci; but also as major centres of socio-political and economic origination. A mile North of the Sigiriya Citadel is Pidurangala which served as the royal monastery. A despoiled dagaba at the foot of the hill could well have been the cremation site of King Kasyapa who founded the Citadel. Carbon datings at the site coincide with the traditional date of the demise of the King. Above the modern temple are the old image houses. A flight of steps leads to the summit, where a long cave has a large recumbent image of the Buddha in brick and stucco. It has been dated to the late Anuradhapura period around the 10th century.